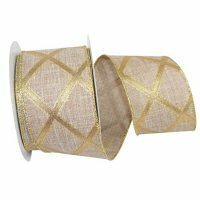 This elegant Natural Linen Ribbon with a Gold Metallic Diamond Print is perfect for your packaging, crafts & so much more. The Gold Metallic Wire Edge of this Natural Linen Ribbon helps it maintain its shape & flexibility, so you can create beautiful creations! The Ribbon Diva offers a great selection of Natural Linen Ribbons for any Season or Event.